Since its establishment in 1986, Happy Science has been aiming to light a torch of Buddha’s Truth in every corner of the world. Today, the Truth has reached more than 12 million members in over 100 different countries, and it still continues to further spread at a steady speed. We conduct a variety of activities based upon the belief that the happiness of the society as a whole is realized through the happiness of the individual.Happy Science temples are sacred places to deepen our love and faith, and to heighten our enlightenment. It is a special place that receives heaven’s light and provides us with an environment to experience life on a much more profound level. Here, we can take time in deep introspection, cultivate serenity, meditate and feel divine light and love. Our minds are easily clouded from the rough vibrations of modern-day living, and it becomes increasingly difficult to connect with our deeper selves – our true self that is in touch with our guardian spirit, High-Spirits and the Lord. 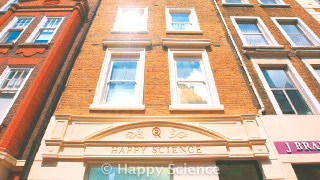 Our Happy Science temples are places where we can completely retreat from our busy modern lives, and find a sanctuary for our mind and soul. It is a spiritually protected place where everyone can safely meditate and self-reflect. We also hold special events on a regular basis such as international retreats where members and non-members can come together to meet and advance in their soul training. In order to accommodate various types of activities, we have around 10,000 Shojas, local branches and temples, and missionary centers all over the world, for the Happy Science activities to be conducted. Other than in Japan, Happy Science hold activities in the US, Canada, the UK, Germany, France, Bulgaria, Australia, Brazil, Mexico, Peru, Korea, Thailand, Singapore, Malaysia, Nepal, India, Kenya, Uganda, Haiti and in many other parts of the world. Members visit their local branches and temples as well as the main temples on a regular basis to recharge themselves with spiritual energy through self-reflection, and discipline themselves towards higher enlightenment in order to carry out activities in creating an ideal world. Happy Science local branches and temples, and missionary centers are the “town square of the soul” in your community, like a lighthouse shining heaven’s light to the surrounding area. Members as well as non-members are always welcome to visit to study the books, watch the video lectures, practice meditation, attend prayer services, or just to have an uplifting chat with Dharma friends. It is your spiritual home where you can come to seek advice to any life problem, and re-energize yourself with heavenly light. Everyone is welcome. Local branches and temples, and missionary centers are exactly where the activities of Happy Science originate. In every local branch and temple, there is a prayer hall that anyone can visit, and the following events are held there on a regular basis. Happy Science conducts a number of services such as Sunday Service, 7th Day Gratitude Service and Memorial Day ceremonies, led by the Head Minister of each location. Events are held regularly, where members gather to watch Master Ryuho Okawa’s lectures. Aside from the DVD lecture showings, they are broadcasted live when there is a special event anywhere in the world. Various prayers such as “Prayer for Economic Prosperity,” “Prayer for Success,” “Prayer for Exorcising Evil Spirits” and “Prayer for Recovery from Illness” are offered. Many members attend the ritual prayers every month, pledging to continue in their efforts in the month to come. Ceremonies held by Happy Science – New Year’s Celebration, The Day of the Great Enlightenment, Celebration of the Lord’s Descent, El Cantare Celebration and the 7th Day Gratitude Ceremony – are held to give thanks to the Lord El Cantare, where Dharma Friends gather together.